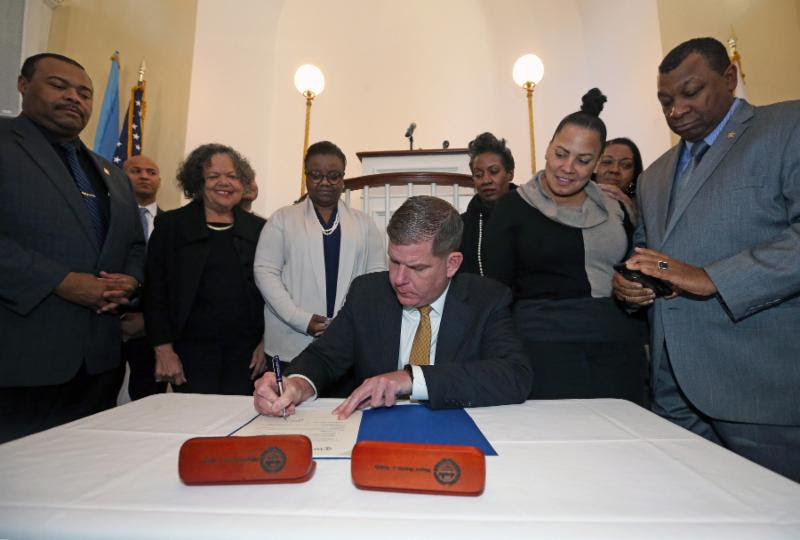 Building on his administration's commitment to ensure Boston is an equitable city for all, Mayor Martin J. Walsh today enacted a promise made in his State of the City address, and signed an Executive Order Relative to Racial Equity and Leadership. This Executive Order strengthens the City of Boston's commitment to enhancing the city's collective resilience by advancing racial equity, prioritizing social justice and strengthening social cohesion across all city agencies. The Executive Order requires all city departments to proactively engage in a Racial Equity and Leadership (REAL) Training Program, including data collection and evaluation of how racial equity is being advanced across departments. Additionally, departments will be required to develop individual plans and goals for resilience, racial equity, and social justice. This work will be done in collaboration with the Mayor's Office of Resilience and Racial Equity (MORRE), an office established by Mayor Walsh in 2015 that is tasked with leading citywide efforts to help Boston plan for and overcome racial and economic equality. "To create citywide resilience, Boston must continue its work across all communities, including within our own city government, institutionalizing racial equity in our workplaces and practices," said Mayor Walsh. "Local government has the responsibility and capacity to address issues of racial equity and close racial disparities. My administration will be evaluating our existing policies and programs to create a culture that advances racial equity, making Boston a more welcoming and equitable city for all." "We know that communities of color constitute 53 percent of Boston, and we are conscious of the role that the city needs to play in elevating those communities" said Lori Nelson, Chief Resilience Officer. "The City of Boston is committed to working with community members, leaders, organizations, and institutions to create effective programs and practices that work to advance racial equity and strengthen social cohesion across every city agency." In 2017, Mayor Walsh released Boston's first citywide Resilience Strategy. Boston's Resilience Strategy is focused on ensuring every resident can reach their full potential regardless of their background, and removing the barriers of systemic racism that hinder Bostonians from having access to opportunities.The strategy was developed as part of the Boston's partnership with 100 Resilient Cities (100RC). Boston was named part of the 100RC Network in December 2014. As a member of the 100RC Network, Boston has received tools, technical expertise, funding and other resources to build resilience to the challenges of the 21st century. "Today's announcement from Mayor Walsh further exhibits the City of Boston's commitment to an equitable and resilient future for all Bostonians," said Corinne LeTourneau, Managing Director of North America at 100 Resilient Cities - Pioneered by The Rockefeller Foundation. "As a proud partner on the city's first-ever Resilience Strategy, we are excited to see initiatives like this bring the pages of Resilient Boston to life. The Executive Order represents an important step forward for the city, and we look forward to partnering for years to come." Under Mayor Walsh's leadership, the City of Boston has taken significant steps towards addressing racial and economic disparities, including signing an Executive Order to ensure that minority and women entrepreneurs are afforded fair and equitable opportunities when competing for city contracts. In addition, in Mayor Walsh's State of the City address he announced the creation of Boston's Economic Development Center. The Center is designed to engage with residents on economic development policy around job growth, business development, placemaking and community economic development. The Economic Development Center will be at convenient, accessible locations in every neighborhood throughout the year, offer interpretation services upon request, a child-friendly environment, and will serve as a vehicle to generate economic opportunities for all residents and businesses in Boston. Earlier this year, Mayor Walsh released the City of Boston's Economic Inclusion and Equity Agenda, a legislative package focused on ensuring equity, opportunity and resilience for all Massachusetts residents, with bills related to economic mobility and housing security, transportation and the environment, and education funding. In August 2015, Mayor Walsh created the position of Boston's Chief Resilience Officer, a position created to lead resilience efforts to help Boston prepare for, withstand, and bounce back from the "shocks" - catastrophic events like floods, infrastructure failure and acts of terrorism - and "stresses" - slow-moving disasters like persistent racial and economic inequality, lack of affordable housing and unemployment. The Mayor's Office of Resilience and Racial Equity leads efforts to help Boston plan for and deal with catastrophes and slow-moving disasters - like persistent racial and economic inequality - that have become part of 21st century life.